Traditional aesthetic, modern feel = happy birthday! A fitting tribute to a company that many regard as synonymous with world-class hand percussion. The congas and bongo set are quite possibly all you'll ever need. Spot on build quality and traditional aesthetic. Dazzling finish and solid retro hardware. Limited edition = serious outlay, but it's probably a good investment for collectors. Having forged a legendary reputation, LP is now into its fifth decade providing scores of world-class percussionists and aspiring players alike with the industry-standard choice. Martin Cohen's company produces a vast catalogue of instruments that are both durable and widely regarded as the real deal. This limited edition 45th Anniversary range offers the player a choice of an 11" quinto, 11 3/4" conga and 12 1/2" tumba with a matching bongo set, mambo cowbell and cabasa (not included in this review). The congas stand 30" tall and their shape is inspired by LP's original design dating back to the '60s. They're constructed from kiln-dried ash wood with a slim reinforcing layer of fibreglass applied to the upper part of the inside of the drums. This serves to add strength while focusing the tone. "You could play these for hours and not feel like you've been whacking a table top as with some bongos - courtesy of the heads which give and take with every stroke." 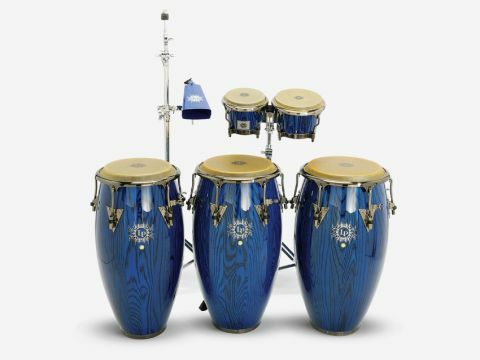 The congas and bongos are beautiful, with a rich dark blue gloss finish highlighting the wood grain patterns underneath. With brushed nickel hardware throughout, heart-shaped tension plates and LP's Comfort Curve II extended collar rims, they certainly look a class act. All of the instruments sport the company's brand new 'tribal' logo, and on the congas and bongos the logo's Silver Sparkle finish contrasts beautifully with the blue grain swirls. Matching chunky carrying handles make carting the congas around easy and they all have mounting collars which can be situated on either side of each drum if you decide to stand-mount them. The inclusion of LP's minimalist but highly effective 'Pro-Care' rubber protectors on the tension screws means that even if you happen to knock the drums against each other that finish won't get ruined. A unique and highly practical touch is found on each of the three drums in the shape of an integrated, screw-tightened mounting bracket. This allows you to attach a variety of auxiliary items such as bells, blocks, splashes and, perhaps most usefully, microphones! You could then wail away as hard as you like in the knowledge that, even if you move any of the drums while playing, you will always get a consistent mic level. The mambo cowbell is a large, affordable bell that would work equally well in timbale or drum set situations. It has an easily adjustable mounting bracket that is especially kind on the fingers. When mounted and gently finger-tightened, the bell is reassuringly steady and didn't budge even under heavy abuse. The congas were beautifully responsive and, even when played placed on the floor, had a deep, full sustain in the bass frequencies; mid-tones and slaps were easy to elicit and the feel of the durable but highly responsive heads was a pleasure. The addition of the thin fibreglass internal coating did seem to make a difference and possibly tightened up the tonal palette, producing a highly musical set that you will be sure to be impressed by. The bongos were a real joy to play and the heads were of the thinnest but most beautifully consistent rawhide that produced a clarity and sustain rarely found on modern models. They give you clear articulation of every stroke across the dynamic spectrum, are kind on the fingers and easy on the eye; a traditional design brought bang up to date. The somewhat squarer bearing edges sit satisfyingly proud of the Comfort Curve II extended collar rims and they're comfortable played in the 'traditional' between-the-knees position. You could play these for hours and not feel like you've been whacking a table top as with some bongos - courtesy of the heads which give and take with every stroke. The middle of the mambo cowbell's top playing surface is raised slightly so you can get a consistent tone while also making multi-tone patterns easier to play. This is an articulate bell possessing a deep but desert-dry tone that's going to come across loud and clear even when employed in large ensembles.